There are special movies out there that are so imaginative, so expertly made, so unbelievably complex that I feel paralyzed after watching it. I guess that makes me weird, but I don’t care. Proudly, I can say Beyond the Black Rainbow is one of these movies and was more than worth the wait. The Arboria Institute promises happiness through a wide range of psychotherapy and pharmacology. A young girl Elena (Eva Allan) has yet to see any of this happiness. Her whole life has been spent in Arboria with the sadistic Dr. Barry Nyle (Michael Rogers) toying with her psychological well being and crafting her into something mysterious. One night, Elena’s cell door opens and she begins an odyssey through the depths of the Institute for her only chance of freedom. This is a very deliberately paced film. There is a lot of time spent taking in the atmosphere of Arboria, e.g the sounds, lighting, and what secrets other areas hold. Woven with in this is a story that is present even when it doesn’t seem like anything is going on. Paying attention to the details of someone’s facial expressions can add a layer of the story that wouldn’t be present if you momentarily drifted or stopped watching. The soundtrack in this is incredible. Jeremy Schmidt has created a fantastic mono score using only a synthesizer. It’s ambient and haunting, when need be, and perfectly compliments the scenes. Anything music that’s more cinematic or sweeping would have been too much. It’s the minimal score that really gets the mood across. Sometimes the only music for a very long time is this wave like noise that sounds like it could be one of the machines in the institute. The look of this film is also one of a kind. Set in 1983, and hearkening back to the time of midnight movies, there is a great blend of actual early eighties style and the exaggerated science fiction look. Some of the set design looks like it could come right out of 2001: A Space Odyssey. 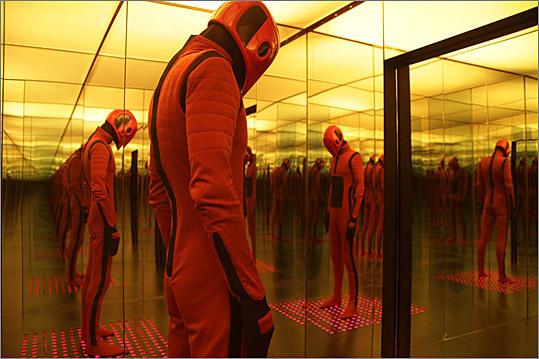 Clearly, Beyond the Black Rainbow got a lot of inspiration from that film. The incredible lighting effects and other special effects really stand out. When Elena first begins her escape, we see her ghosting behind her actual person creating this strong illusion of disorientation for the viewer. It’s easy to get lost in the labyrinthine Arboria Institute. The entire mood of this film is very off putting and disorienting forcing the viewer to get caught up in its psychedelic web of mania, paranoia, and despair. 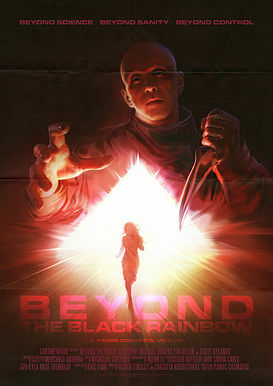 After my first viewing of this, and I’ve watched it two days in a row, I thought, “Why?” What is Panos Cosmatos saying with Beyond the Black Rainbow? At this point, I’m still not 100% sure. There is a lot to wrap your head around, and a lot of questions that will pop up like weeds. This is really a fantastic and unique film that demands a lot of patience and your full attention. It’s very slow, but very beautiful and the pacing is used to immerse you totally in what’s happening on screen. For me, this is a perfect movie. I’m sure other people can find faults with it, but I can not. It exceeded my expectations and gave me a ride that I will never forget. 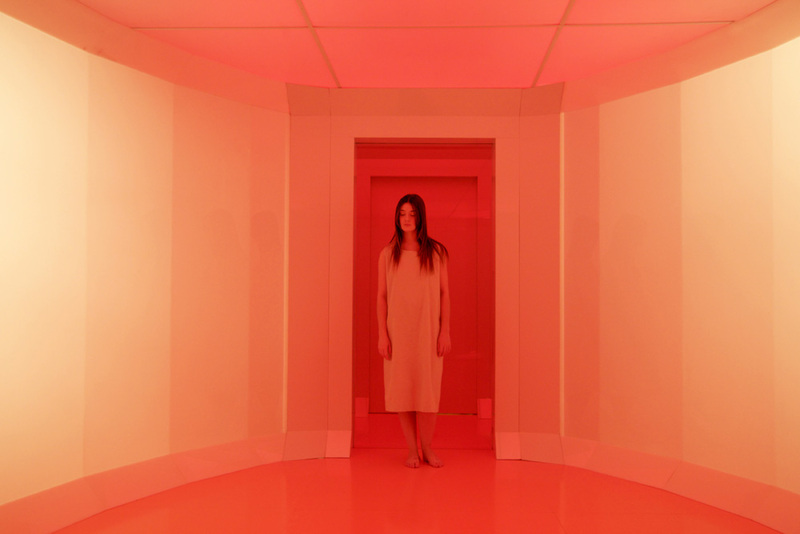 Tune in, tune out, drop in, drop out, and enjoy Beyond the Black Rainbow.